Herald science reporter Jamie Morton is profiling a series of new studies taking place in Antarctica, where he travels to this month. Today, he talks to the University of Waikato's Professor Craig Cary. Hidden within Antarctica's most active volcano could be a key to understanding life on other planets – and now scientists plan to drill into it. The geothermal features found on Mt Erebus, overlooking New Zealand's Scott Base, are home to an abundance of micro-organisms with some extremely unusual features. Scientists believe they may even have the potential to change how we understand life itself. In a previous study, Waikato University microbiologist Professor Craig Cary and colleagues dug just 12cm into the soil on the mountain to find a remarkable variety of bacteria living just below the surface. Cary said those very near the surface were very closely related with other such organisms living in geothermal systems elsewhere in the world – a finding that suggested these microscopic beings were being continually dispersed around the planet through the atmosphere. "In this case, they could have originated from a massive volcano going off sometime in the past and moving them around the world and into other geothermal sites." But, more interestingly, they also discovered bacteria that are not only appear endemic to Erebus but ancient when compared to those living today. "As we went deeper and deeper into the soil, it wasn't just novel bacteria we were finding – but possibly bacteria that are adapting to the novel geochemistry, or gases, at Erebus," he said. "We have known for over a hundred years that there are bacteria that can live and grow on energy bound up in certain chemicals common to geothermal systems when normal carbon-based food is limited. "What is new on Erebus is that these chemicals are not abundant and yet we find bacteria thriving in this carbon limited environment." "We know there's a lot of unique geochemistry on Erebus – but so far have not figured out how any bacteria are actually able to utilise it." In a new three-year programme, just awarded a $935,000 grant from the Marsden Fund, a team led by Cary and Dr Matt Stott of the University of Canterbury will return to Erebus to investigate further. They'd first drill directly into the volcano and use some new exciting approaches to grow the bacteria, before using a range of genomic methods to work out how they function and survive. The team hoped to uncover new biological mechanisms for life that have never been seen, yet remained theoretically feasible. "Put simply, we only know what we know," Cary said. "Our current notion of life is very constrained around what we've already found and have been able to grow. "And, at Erebus, we believe there is an isolated system with novel geochemistry that can drive completely unusual mechanisms to support life – and this would be appropriate for looking for life on other planets." It's not the only major new study exploring Antarctica's incredible microbial communities. Another project, led by Cary's Waikato University colleague Dr Adele Williamson, is attempting to reveal how the hardy microbes that live amid the McMurdo Dry Valleys' alien-like conditions can survive by repairing their own DNA. 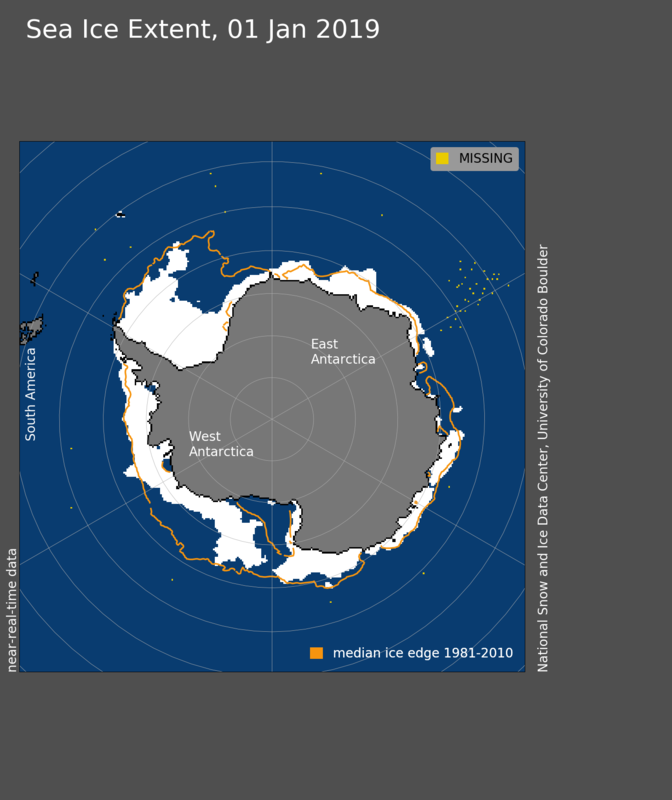 Normally sea ice in Antarctica shrinks through January and into late February as the Antarctic summer progresses, but on Jan. 1 the Antarctic sea ice was already at a record low extent for the month. 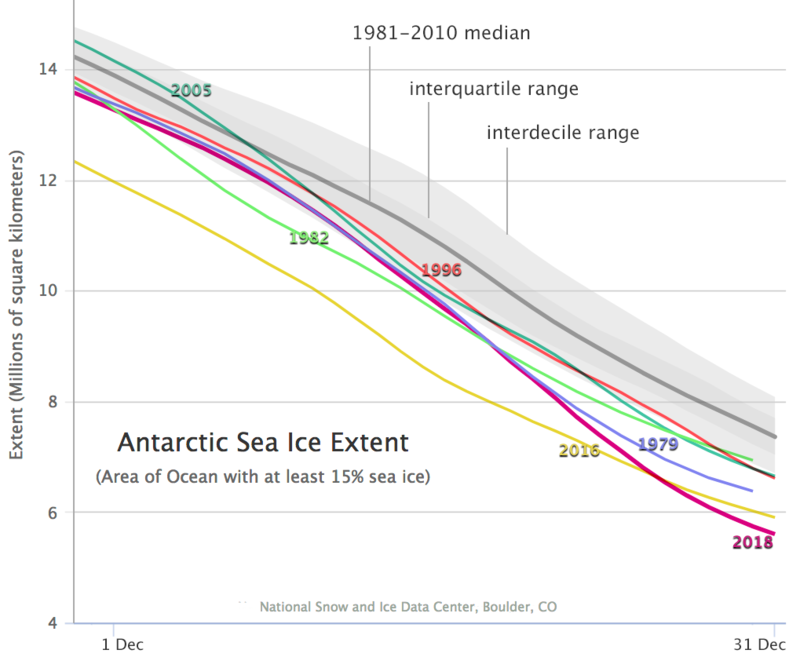 There is an extraordinary amount of sea ice melting going on right now in Antarctica. Every day of melting in January creates a new record. Most likely in Feb or early March we'll see the all-time record low for Antarctic sea ice extent! On January 1, Antarctic sea ice extent stood at 5.47 million square kilometers (2.11 million square miles), the lowest extent on this date in the satellite record (since 1978). This value is 30,000 square kilometers (11,600 square miles) below the previous record low for January 1, set in 2017, and 1.88 million square kilometers (726,000 square miles) below the 1981 to 2010 average. Extent declined at a rate of 253,000 square kilometers (97,700 square miles) per day through December, considerably faster than the 1981 to 2010 mean for December of 214,000 square kilometers (82,600 square miles) per day. Indeed, the rate of Antarctic ice extent loss for December 2018 is the fastest in the satellite record, albeit close to 2010 and 2005. The huge hole -- measuring almost 1,000 feet (300 meters) tall -- was found growing at an "explosive rate" at the bottom of a glacier in West Antarctica, said NASA's Jet Propulsion Laboratory in a statement Wednesday. "The size and explosive growth rate of the newfound hole, however, surprised them," they said. The cavity was "big enough to have contained 14 billion tons of ice, and most of that ice melted over the last three years," they added. 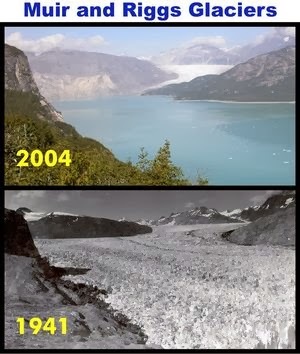 ....The glacier holds "enough ice to raise the world ocean level a little over 2 feet (65 centimeters)," said the team. Thwaites also "backstops neighboring glaciers that would raise sea levels an additional 8 feet (2.4 meters) if all the ice were lost," they added. Once that hole under the Thwaites Glacier gets big enough, the ice in the glacier above will begin to collapse down into the hole, calving off huge bergs. This is a very rapid process, and the glacier front will begin to retreat as it comes off its grounding line. This kind of rapid calving retreat is how Glacier Bay was created in 100 years up here in Alaska, and how Jacobshaven glacier is currently retreating in Greenland. One of the most wonderful experiences I ever had was camping on a ledge next to glacier in SE Alaska to make time-lapse movies of the ice calving off over the course of several days. The giant ice collapses and the spectacular impulse waves produced by the calving ice are amazing to see. I expect this process will begin at the Thwaites fairly soon. rockdoc123, if you are still out there, I'd be interested in learning if you think this new finding of "irreversible" sub-sea melt fits together with the model of ice sheet dynamics DeConto and Pollard published in Nature. Based on our prior discussions, you seem to be one of the more well-versed on the subject around here. Here we use a model coupling ice sheet and climate dynamics—including previously underappreciated processes linking atmospheric warming with hydrofracturing of buttressing ice shelves and structural collapse of marine-terminating ice cliffs—that is calibrated against Pliocene and Last Interglacial sea-level estimates and applied to future greenhouse gas emission scenarios. Antarctica has the potential to contribute more than a metre of sea-level rise by 2100 and more than 15 metres by 2500, if emissions continue unabated. The linked article (and following associated references), cites recent model work about ice sheet stability that gives more conservative estimates of abrupt ice mass lost from ice sheets this century, than that predicted by Pollard & DeConto (2016). However, for me one critical consideration about these findings is the both Pollard & DeConto declined to serve as co-authors for this work because they believe that the projected SLR are too conservative. Title: "Studies shed new light on Antarctica’s future contribution to sea level rise"
Considering the theory of MICI was proposed less than eight years ago, it is still very early in terms of refining the estimates of what impact it could have. However, as scientific disagreements go, this is definitely the more cordial kind. Both DeConto and Pollard were originally co-authors on the new paper. They later recused themselves because they felt the results coming from Edwards’s statistical model were not consistent with what they were seeing from their own physics-based glacier model." The rapid retreat of huge tidewater glaciers in Alaska and Greenland due to. MICI is very well documented. Pictures at link below quote. This is going to be interesting to follow if the MSM doesn't drop the ball. An iceberg twice the size of New York City is about to break off from Antarctica's Brunt Ice Shelf, according to NASA. The space agency released aerial images which show massive cracks along the frozen landscape that have been growing since October 2016. Once the cracks meet, the outer ice is expected to completely snap off and float away, reports Newsweek. However since the broken ice, known as the Halloween crack, first appeared in late October 2016 the research station has had to be relocated over the last few years. Scientists have been closely monitoring the growth of the crack through satellite imagery and now NASA say it is the "countdown to calving" after another massive chasm started growing in the area. Ice calving is where an iceberg breaks away from the edge of a larger body of ice is a natural process that regularly happens. Another recent example was the 2017 calving of a Delaware-sized iceberg from the Larsen C ice shelf that broke away from the Antarctic Peninsula. But the calving at Antarctica’s Brunt Ice Shelf is unusual as NASA say that the region was originally thought of as stable. However, the crack has been growing at a rate of around 2.5 miles per year. Pictures from NASA's Operational Land Imager show how the crack has grown eastwards from an area dubbed the McDonald Ice Rumples. In a statement, the space agency said: "It is not yet clear how the remaining ice shelf will respond following the break, posing an uncertain future for scientific infrastructure and a human presence on the shelf that was first established in 1955. “The rumples are due to the way ice flows over an underwater formation, where the bedrock rises high enough to reach into the underside of the ice shelf. The latest crack has led to concerns about the Halley Research Station, which is run by the British Antarctic Survey. Usually, the base runs year-round, but the “unpredictable changes” to the ice has meant it has had to shut down twice over the last few years. A spokesperson from the BAS told Newsweek that the safety of its staff is the top priority and they are constantly monitoring the movement of the ice. She said: "Our most recent (February 10) high-resolution synthetic aperture radar image showed that the rate of widening of the crack does appear to have increased since mid-January, but not enough to cause alarm," she said. "The station is designed to be relocatable. In 2017 BAS successfully relocated the station’s eight modules 23km (14 miles) upstream of a previously dormant ice chasm. "The frequency of relocation depends very much on how the ice behaves in the future. "Our long-term ice monitoring project is designed to alert us of any significant change in the ice." It's always a freaking surprise. Anyone who thinks that sea level rise will be well under 2 meters by 2100 is seriously deluded. All of the land ice sheets have been surprising researchers over the last 20 years. And this process is accelerating and intensifying. Ice sheets are meta-stable entities that can disappear extremely quickly. And they decompose volumetrically and not just through surface losses. Just coming back from Antarctica now. Very nasty weather crossing Drake Passage. We should reach Cape Horn sometime tomorrow afternoon, and then sail into the Beagle Channel. We plan to refuel in Ushuaia. Antarctica was spectacular. We had very good weather, considering the summer season is at an end. Many many many penguins, whales, fur seals, Weddel seals, crabeater seals. We watched as two leopard seals took Gentoo penguins chicks from a beach. All in all wonderful. Saw some small ice shelves on the east side of the Antarctic Peninsula. They don’t get the press that Larsen A and B got when they disintegrated, but they are collapsing as well. Penguin populations also changing quickly in response to climate change. Very cool, in more than one sense. Dr Fretwell told BBC News: "The sea-ice that's formed since 2016 hasn't been as strong. Storm events that occur in October and November will now blow it out early. So there's been some sort of regime change. Sea-ice that was previously stable and reliable is now just untenable." The BAS team believes many adults have either avoided breeding in these later years or moved to new breeding sites across the Weddell Sea. A colony some 50km away, close to the Dawson-Lambton Glacier, has seen a big rise in its numbers. Quite why the sea-ice platform on the edge of the Brunt shelf has failed to regenerate is unclear. There is no obvious climate signal to point to in this case; atmospheric and ocean observations in the vicinity of the Brunt reveal little in the way of change. But the sensitivity of this colony to shifting sea-ice trends does illustrate, says the team, the impact that future warming in Antarctica could have on emperor penguins in particular. Whether the Halley Bay colony specifically really had a future is a moot point. The Brunt Ice Shelf is being split apart by a developing crack. This chasm will eventually calve an iceberg the size of Greater London into the Weddell Sea, and any sea-ice stuck to the berg's edge may break up in the process. The colony could have been doomed regardless of what happened in 2016. Drs Peter Fretwell and Phil Trathan report their investigation in the journal Antarctic Science. 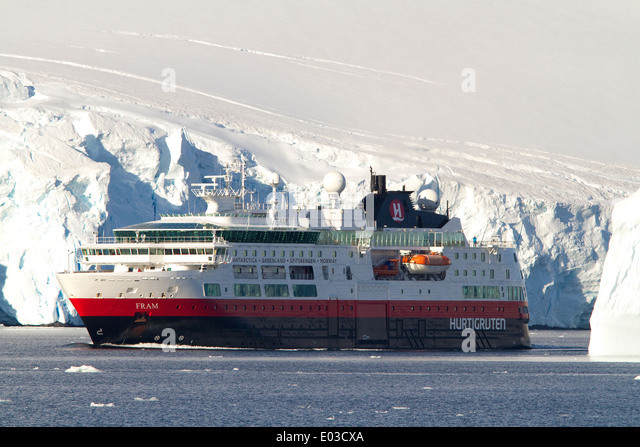 I visited Antarctica on a small expedition cruise ship called the Fram....named after Amundson's famous Fram. The ship was equipped with hard shell zodiacs that can do beach landings, and we did two landings per day (unless there was too much ice in the channel to get ashore). The Fram would move to a site and put people ashore in the morning. In the afternoon you'd move to a different spot and go ashore again. On shore we saw penguins, fur seals, leopard seals, volcanoes, glaciers, ice cliffs, etc. If there was too much ice the zodiacs would do a tour through the ice-choked bay, and we'd see seals and whales and icebergs. Just about every inch of land is covered with spectacular glaciers calving into the sea, so there were huge ice covered mountains and ice cliffs on every side. The calving events produced local impulse waves (ie small tsunamis), so sometimes you'd have to hurry off the beaches. We did hikes around some very large penguin colonies and visited some research station and hiked up into the lower slopes of the glaciers and mountains. My favorite memories are (1) seeing a leopard hunting and taking gentoo penguins off the beach, and (2) as we sailed away from Antarctic for the last time the Fram was equipped with a hot tub on deck, and I sat in the hot tub watching the icy landscape roll by as we headed back north. It all was amazingly fun and very educational.